Everyone has a favorite author. Some people even have lists of favorite authors. In this case, I read a book some time back written by one of my favorite authors: Andre Norton, the Grande Dame of science fiction. I read this book for two reasons: 1) it was written by Andre Norton – that almost guarantees a good story; 2) the title of the book is Star Gate. Stargate, the movie and the television series, refers to a circular portal that creates an artificial wormhole between planets. According to the film and TV series, the Stargates were built by a vanished race of aliens – called the Ancients – who lived on Earth long before humans did and who populated the galaxy. Through one event after another, however, these Ancients dwindled and died off, leaving room for humanity to move in. I have not seen the Stargate film straight through. However, I am a big fan of the spin-off series Stargate SG-1 (SG stands for ‘Stargate’ 1, or Stargate team 1). Stargate SG-1 was in the top tier of my favorite TV shows when it was running; since the series finished its run, TV has gotten somewhat boring. Nothing but crime shows everywhere one looks. *Sigh* They just don’t make sci-fi shows like they used to. Anyway, back to Andre Norton’s Star Gate. I am very lucky that the book had a description inside the cover; otherwise Norton’s story might have shocked me. 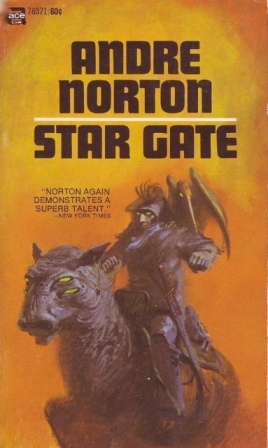 Andre Norton’s Star Gate is nothing like the movie or the TV series. I highly doubt the creators for either the movie or the series even know about the book that bore the name of their movie/series before they even had the idea for their stories. Yep, you guessed it. The Star Lords are human travelers from outer space. The Star Lords met and tamed the native Gorthians. By ‘tamed’ I mean they taught them metal working, farming, etc. They essentially gave the Gorthians all the marks of civilization. By the time of Star Gate, the Gorthians are experiencing their own High to Late Middle Ages. The Star Lords have remained with them up to this point, never imposing their will on the Gorthians. The two races have been friends almost since the Star Lords’ arrival. In fact, they are on such good terms that intermarriage between the long-lived Star Lords and Gorthians is not unheard of. It’s not exactly common, since there are few Star Lords and they live a long time, but it’s not forbidden either. The book starts out with the Gorthian protagonist, Kincar S’Rud (I think S’Rud means ‘Son of Rud’), thinking over his planet’s history and his own future. From him we learn that native Gorthians have very pale skin – I believe their skin is almost albino white – blue/green hair, and six fingers on each hand. This is in sharp contrast to the Star Lords, who are described as having darker skin and – of course – ten fingers between their two hands. They are also much, much taller than the average Gorthian and live apart, in a city built around their starships. Kincar is the son of the daughter of the ruler of his keep. His mother has been dead for most of his life, and his grandfather appears to be dying. But this is the least of Kincar’s worries at the moment. His cousin and rival for mastery of the hold has come to the keep, bringing strange rumors with him: the Star Lords are planning to leave Gorth! For some reason, this cousin of Kincar’s does not like the Star Lords. He is not the only one, to be sure, but these haters are largely outnumbered by the average Gorthians, who appreciate the learning and peace the Star Lords have brought to them. Kincar is among the latter group and – more to the point – he does not like this cousin a whit. The guy apparently has a nasty attitude that could breed more nastiness if given the chance. And what better chance would this cousin have to let loose with his bad attitude than to be named holdruler of the keep? Technically, mastery of the hold should pass to Kincar when his grandfather dies. But Kincar soon learns that there is a snag. His mother was Gorthian – but his father was a Star Lord! A half-blood could rule a Gorthian keep no problem – except that Kincar’s troublesome cousin could make it a very BIG problem. With Kincar’s half-blood status, he could challenge Kincar’s legal right to take mastery of the hold. A good number of the hold residents would probably support Kincar taking power, but his cousin and his supporters could take up arms against Kincar’s supporters which would lead to outright battle for the position of holdruler. Kincar therefore has two choices before him: stay and fight his cousin, causing bloodshed and possibly kin strife within the hold, or leave and find the Star Lords with whom he will be safe from his cousin. It’s a hard decision for him. The hold is his home, his security; Kincar knows of the Star Lords but he has never met one. Still, he decides that the price of remaining in his beloved hold would cause too much strife. So he leaves. He’s not gone long when a horn sounds, proclaiming the death of his grandfather. He has to pick up his pace now. As long as he lives, he is a rival for mastery of the hold. And bad guys really hate rivals, especially when those rivals are so much better than they are themselves. After a few days travel, Kincar meets a handful of half-bloods traveling to an undisclosed location. The group is attacked and two Star Lords burst into the fight, rescuing their kin from danger. Kincar is practically thunderstruck by the mere sight of the Star Lords. After all, he’s heard about them but he’s never seen them. A legend is much more intimidating when one is looking it straight in the face. After beating off a second attack, the group reaches a larger gathering of Star Lords and half-bloods. This gathering includes women and children. During the ride, Kincar learns that the rumors about the Star Lords leaving Gorth are true. The Star Lords have experienced a severe division of policy: a handful of the Star Lords think that the Gorthians should become their slaves. The rest find this idea abhorrent and are leaving to avoid the temptation to enslave the people they have helped to civilize. This particular conclave of half-bloods, Gorthians, and Star Lords – most of them related by marriage or blood – has decided to remain on Gorth. To them it is home. No other planet in the galaxy could compare. Those who are attacking them are the Star Lords who are determined to take Gorth and make slaves of the Gorthians. Kincar finds himself ill at ease with these Star Lords and half-bloods. Most of the people in this group know each other; most of them are related. He does not know if any of the Star Lords are related to him by his father; they are all strangers to him. They are strangers to be respected and obeyed, yes, but still strangers. And Kincar doesn’t get to know any of them very well in the few minutes he is in the camp. The Star Lords’ enemies attack almost as soon as Kincar’s group enters the camp, forcing the Star Lords to activate their escape plan before they are prepared. What is their escape plan? It involves two pillars tied together by a web of rainbow light. Passing through this web, this Star Gate, the Star Lords are forced to destroy the gate to destroy their enemies and prevent them from following the escapees through to the other side – an alternate Gorth. Aha, now you get it! Andre Norton’s Star Gate does not make a bridge between planets. It makes a portal through time. But this isn’t your run-of-the-mill portal through time, the one that puts you in the far past or in the far future. Instead this gate takes the Star Lords to a Gorth in an alternate timeline; it is the same Gorth, but someone or something in its history took a different course of action. Thus the Gorth that Kincar and his companions have just entered is the same as the Gorth they left, but its history is not their history. The entire thing works more like a…. Sidestep through time than a jump forward or backward in time. It’s a little like the reality-hopping adventures which the characters in the TV series Sliders experienced. It’s the same planet, but everything and everyone on it is different from what they knew on ‘their’ planet. The Star Lords had hoped to land in an alternate timeline where Gorth had no people on it. Problem is, before they could find this alternate Gorth they were attacked. It was go through the portal or get killed. With the gate destroyed, they may be stuck on this Gorth instead of the one they wanted. A little recon soon shows them that not only did they find a Gorth with people on it, they have found a Gorth where the Star Lords are a lazy, cruel people. These Star Lords have enslaved the native Gorthians, who were already civilized by this time (something like 20th century civilization was my impression). They have walked into the very horror they were running from in their own Gorth. Now the group has a choice: find a way to the Gorth they want and leave this Gorth as is; or defeat these evil Star Lords and free the native Gorthians. Of course, to Kincar humans are aliens. But when most science fiction focuses on humanity’s interaction with different races from different worlds, it is a bit of a jolt to read every few lines that having ten fingers is an ‘alien’ quality! Norton was good for stuff like that. Though the book does not resemble either the movie or the TV series with which it has shared a similar name, it is quite as entertaining as its ‘younger siblings.’ An enjoyable read that will keep one turning the pages, Star Gate is one of Norton’s home run stories. I definitely recommend it for light reading. This entry was posted in Book Reviews and tagged Aliens, Andre Norton, Book Reviews, Science Fiction, Star Gate on February 28, 2014 by The Mithril Guardian.